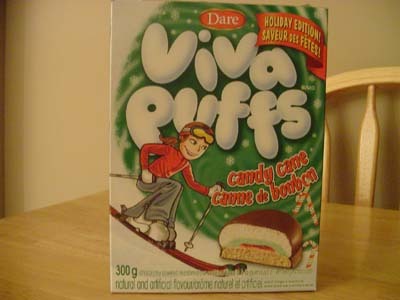 Holiday Viva Puffs! The Xmas Season Starts Now! Another year has come and gone. And it went rather quickly at that. I mean, the site is going to be three years old soon, and it seems like just yesterday I was getting excited about making it to two. Of course, this is not the only reason that I’m particularly infatuated with the month of December. Clearly, the thing that’s currently on the minds of the masses at this time of year are the holidays. Be it Christmas, Chanukah, Kwanzaa, or whatever the Hell else that goes on at this time of year, people all over are feeling a little more festive, and everything starts to reflect that. Supermarkets are no exception to the festivization that December brings, much like when Halloween rolls around in October, everything gets new boxes to reflect the season. While PC groups wouldn’t dare admit it, the world – or North America at least – starts colouring everything Christmas. Red and green start to appear everywhere, and products will take on shapes of trees, snowmen, and Santa. Everything comestible is either dyed or wrapped up to match the colours of Christmas, and today, I will take my first step into the holiday madness. What better place to start than cookies? I love cookies, you love cookies, everyone loves cookies. And if I get wind that someone doesn’t like cookies, let’s just say they’d better watch their back. Nobody’s gonna make my broad statements false. I like to think that I’ve driven the point home that this article is holiday themed by now, but, you know, just in case you missed it. 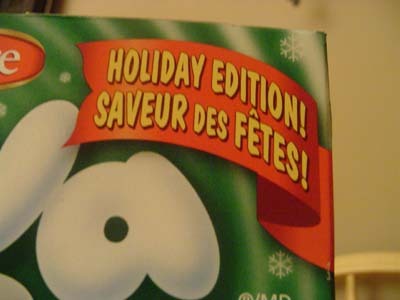 It’s kinda funny, that without this little banner the Puffs really wouldn’t officially be holiday themed. Aside from the fact that candy canes are to Christmas like painted eggs are to Easter, there’s nothing on the box that really denotes a holiday theme. People celebrate Christmas and the like in plenty of places that may have never even heard of snow, and there are lots of things with green boxes that aren’t “holiday editions.” Oh well. 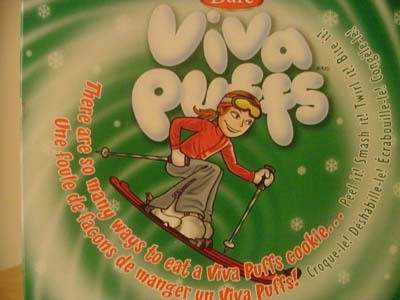 If you know Viva Puffs, you know that they’re already pushing the envelope of how many elements you can mix into a single cookie. 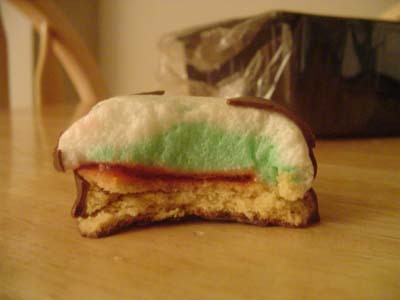 Not only is it a marshmallow coated in chocolate, but it’s also got a crumbly cookie-esque base and that red goop in the middle. Like I said, it’s already a very complicated snack, but they’ve decided to take it yet another step and add a fifth part to the mix by injecting it with minty goodness. Don’t get me wrong, I’m all for stuff tasting like candy cane, but that’s a lot of very different flavours to take in at once. I know I was going somewhere with this, but I’ve forgotten entirely, so let’s take a look at hot skiing girl. Upon closer inspection, I think my statement was pretty accurate. She’s got no rack at all, but that can be overlooked because for some reason winter wear is inexplicably attractive. You may think to yourself that I’m nuts for saying that piling on more clothes is a good thing, but you know in your heart that it’s true. I know it. You know it. Hef knows it. I’m just wondering about those boots. Sure, it might just be the ski boots, but those are some mighty big clodhoppers. You know, I think I may have seen her Italian cousin the other day. But I must digress. 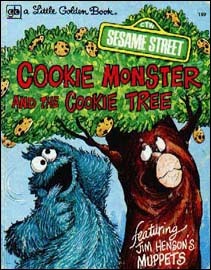 As much as I like judging cartoon girls, there’s cookie to be investigated. 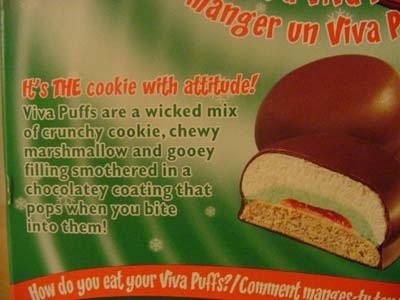 The back of the box boldly claims that Viva Puffs are “THE cookie with attitude.” That’s bogus on so many levels that I don’t even know where to start. The box continues to make wild claims of the wickedness of the cookies and how they pop when you bite them. Now, I’m fairly certain that the writers don’t actually mean that it pops when you bite it, but let’s assume they do. Viva Puffs do not pop. Maybe if you were to put them in a microwave or something, which would probably just end up making it bubble up and make a huge mess, but the point stands that biting a Puff will not make it pop. That would be cool, and highly dangerous. 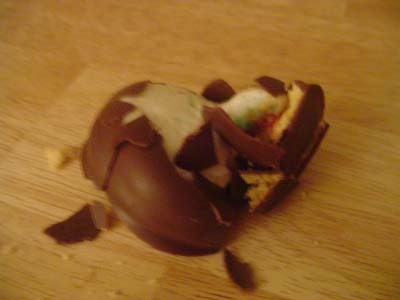 Chocolate shrapnel is one of the leading causes of death in North America, you know. 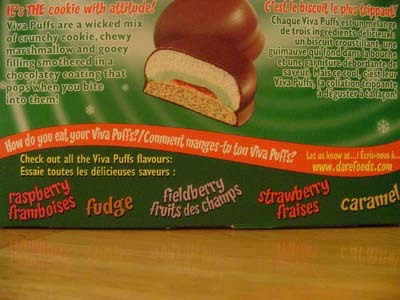 Near the bottom of the box, they go on to promote the other offshoots of the Viva Puff line. Let’s face it, the goo in the middle is all that separates one Puff from another, and it’s not the tastiest stuff in the cookie. I’ll go on record as saying that the raspberry and strawberry types probably taste identical, whilst the fieldberry would just add some sort of sickly blue to the mix. The fudge Puffs would no doubt be the best, and I have an irrational hatred of any caramel that isn’t in a chocolate bar. You may also notice the banner that asks you how you eat your Puffs. It implies that the website might care about this information, but I’ve been there, and it most certainly does not. 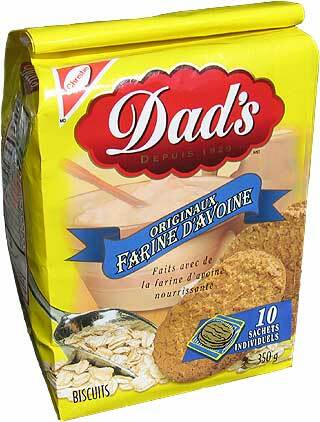 I did, however, learn that Dare has a nut-free policy. Go Dare! Nuts only serve to make cookies and other baked goods gross and inedible! Now we get to the real high point of the box. This little area challenges you to eat the Puffs in many different ways. And when text goes in a half-circle like that one there, you know that you just can’t walk away. It would insult your masculinity to walk away, and if you’re a chick, I’m pretty sure the box is calling you fat. Are you gonna take that? I didn’t think so. It’s time to crack out the puffs. 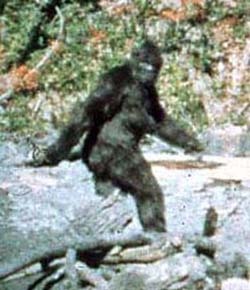 Ah, there she is. Our first victim. 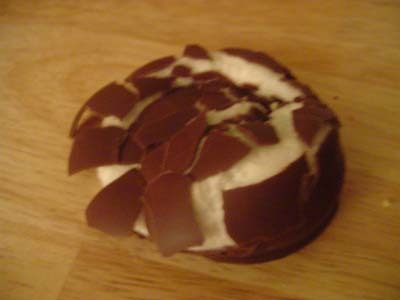 It’s sad that the Puff, like any product that consists of a marshmallow coated in chocolate, is consistently cracked. I would have thought the Puff was better than that, but I guess there is no coating that can survive the terribly difficult trial that is sitting in the cookie aisle. Now, the box has presented me with four challenges. It says that I should be able to peel, smash, bite and twist these Puffs, and while I shall do it all without remorse, there is a chance that there is going to be some prejudice. Possibly of the extreme variety. 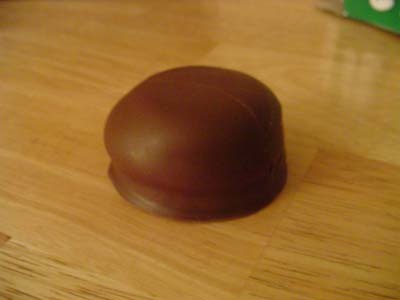 The first challenge I accepted was to peel a Puff. No problem, I’ve seen lots of things get skinned thanks to my vast experience with the internet and movies. Little did I know that the Puff’s chocolatey shell was much different than flesh, and it did its best to stick to the marshmallowy mantle. The fissure down the middle of the shell did help in the matter, as it gave me a good place to start picking at. In the end, while it was a messy and far from complete operation, I think I made my point pretty well. The next Puffs will surely turn tail once they’ve seen what I’ve done to their comrade. I weighed the rest of my options pretty carefully, and I chose to take the biting challenge next. Not only would it be the easiest of the four, but it would also prove to be the least messy. Indeed, after a mighty chomp, there were very few crumbs to be seen, and I was left with a pretty cross-section of the Puff. Well, maybe it’s not so pretty, but it surely wasn’t as mutilated as the Puffs which I smashed and twisted turned out to be. 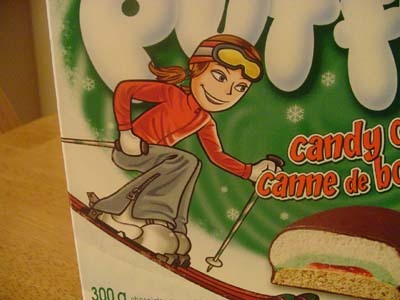 I also quite like the green dye in the marshmallow of the Puff. It’s kind of soothing, in a green sort of way. The next Puff in line was destined for a fate worse than… No, wait, this was pretty much death. The Puff didn’t even see it coming. My fist smashed down on the poor little thing like the big boot on the purple grape. Actually, it was a lot harder than that. And only once. In all fairness, I have to say that I’m surprised at how well the little guy held up under the circumstances. I guess I shouldn’t be, because it’s essentially made of fluff, which is essentially invincible, but I have to say that I did expect bits to go, well, flying. Essentially. The last Puff was easily the worst off of the quartet. This one had to suffer through the agony of being twisted. Truth be told, I had no idea how to go about doing this at first. Twisting a dome-shaped object is not something that one normally does, so I had to think about it for a bit. I wasn’t sure whether holding the top and bottom and twisting would be for the best, or if I should hold it at opposite sides and give ‘er. It was a tough decision, and I had already eaten like half the box, so I couldn’t afford any more Puffs and went with the lengthwise twist. I have to say though, that the twisting did end up with the messiest result. 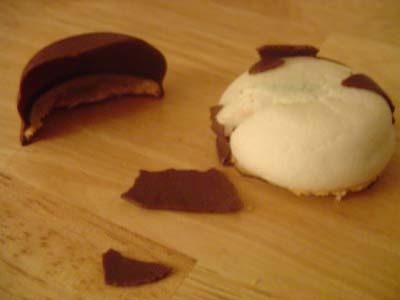 The poor Puff was in shambles, bits of chocolate and cookie strewn every which way, and gooey core spilling out everywhere. I would not wish this fate upon even the worst of my enemies. Well, okay, maybe the worst. What can I say? He’s one-upped me too many times for me to show any mercy. But that’s a whole different story. Let’s just say that I wouldn’t wish the twisty fate upon even my second-to-worst enemy. Technically, I’m not here to review the Viva Puffs. I just wanted to poke fun at the box and mutilate some cookies. But it’s probably a good way to go out. So the holiday Puff is easily the best Viva Puff ever released. The addition of the minty flavour makes it delicious. 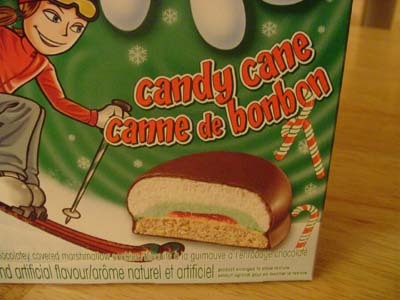 As I said before, I love when they add “candy cane” flavour to anything. I spend lots of time during the Xmas season plotting ways to thieve candy canes off of our tree. Last year I managed to get a whole bunch of the stripey treats, and my stash lasted me well into February. And uh, Viva Puffs are funny.